My approach to literary and media studies, and to comics' scholarship more specifically, capitalizes on what I see to be the field's inherent interdisciplinary potential, by combining literature, art, film studies and cultural theory. In their very ubiquity and popularity, comics, film and television offer immediate value as objects of shared knowledge. In my dissertation, "Comics Explosion: Representations of Persecution in Graphic Narrative, 1995-2015," I read primary materials symptomatically to reveal paradigmatic knowledge formations which mediate historical apprehension. The medium-specific handling of historical persecution in comics affords no special ability to factually depict historical events or phenomena, but I argue that comics denature the conceit of objective historical representation, through their complex interplay of visual and verbal registers as well as the participatory reading they encourage. Dehumanized Victims: Analogies and Animal Avatars for Palestinian Suffering in Waltz with Bashir and "War Rabbit." (2018) Humanities 7(3). Abstract: A common convention in comics and animation is the use of animal stand-ins to provide an access point for human experiences. Whether representing anthropomorphized characters navigating very human experiences or depicting four-legged creatures impacted by human action, this strategy has the manifest intent of fostering viewer identification and empathy. In particular, artists sometimes deploy animal avatars in representations of persecution and historical trauma to avoid depicting identity categories such as race, nationality and sexuality, which constitute the ostensible basis for persecution. 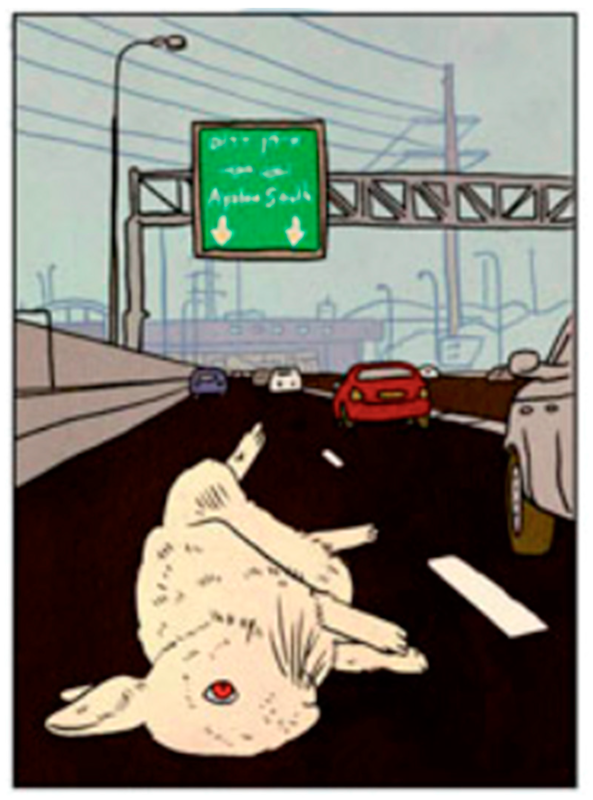 In this way, the use of animals to represent human suffering universalizes experience for which difference matters. In this essay, I explore how these animal stand- ins enable or foreclose empathy with Palestinian victims in the close reading of two primary texts, "War Rabbit" and Waltz with Bashir, which employ animal avatars in place of direct depiction of Palestinian suffering. These illustrated narratives, one a comic and one an animated film, visually rhyme animal and human suffering and verbally lament the deaths of animals. I argue that both texts fail to unpack the analogies they construct, such that these constructions ultimately represent the actual Palestinians victims as being mute and irrational. Thus this use of animal avatars, which is meant to be foster empathy, is instead oblique, and risks further dehumanizing victims and negating their experiences. Abstract: Tracing the emergence and popularity of comic art and theorizing comics in relation to epistemological paradigms, this dissertation takes graphic narrative representations of persecution as its primary object of inquiry. In the past few decades, graphic narratives depicting persecution, from Art Spiegelman’s Maus (1986) to Alison Bechdel's Fun Home (2006), have topped national bestseller lists and become standard texts in high school and university classrooms. While these works undoubtedly have been successful because their serious subject matter corresponds to conventional ideas about what makes good literature, the comics medium also affords new ways to conceptualize history. 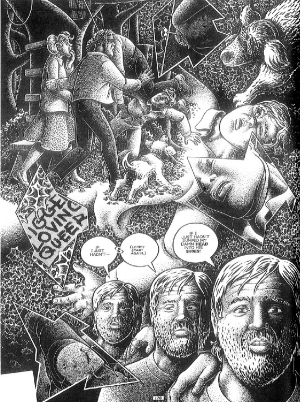 The formal properties of the medium, such as comics' spatial representation of time and comics' visual-verbal tension, lend comics the capacity to contest dominant notions of history, both in offering counter-histories of specific events and in revealing the logics that implicitly inform the telling of history. The primary materials of my study treat topics ranging from legally sanctioned discrimination to violent genocides. The title of my study emphasizes my commitment to demonstrating how comics' formal properties explode, by which I mean both expand and upset, history. These materials include graphic novels that narrate histories of persecution in fictionalized settings and nonfiction graphic narratives that use archival research to document past events. Combining philosophies of history and theories of modernity with formal analysis, I explore how comics engage temporality, subjectivity and vision, and argue that these conceptual frameworks for apprehending history themselves participate in the violences they render legible. Due to the medium's fragmented, spatial-temporal arrangement, comics interrogate temporal boundaries, often visually associating times of past oppression with readers' present. Comics complicate universal history at the level of visual register as well, using iconographic images and anachronistic period-specific art styles to denature linear time, for instance. Comics' multi-modal use of visual and verbal signification, layered across panels and pages, animates the contest between the perspectives of historical witnesses and those of the artists who popularize their accounts. For these reasons, comics not only broaden the practice of historiography, but also challenge historical epistemology and question the status of history telling as a mode of representation.